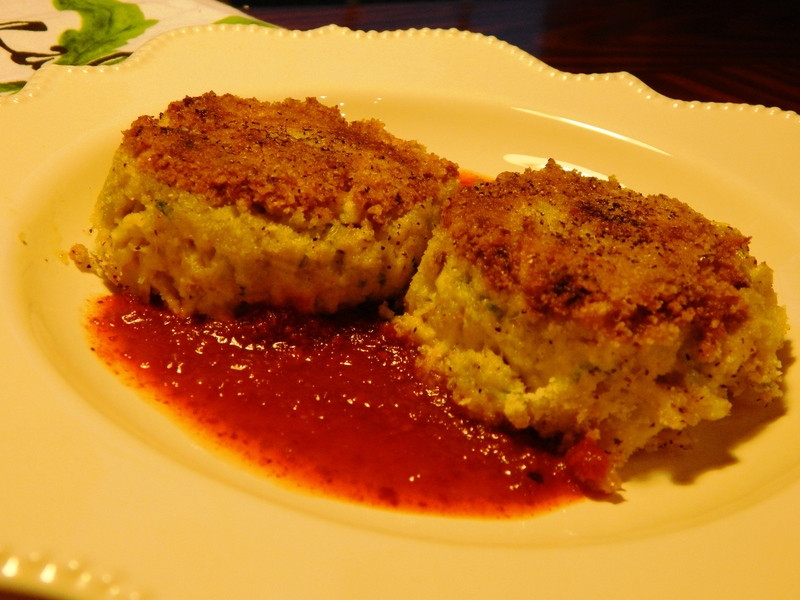 I haven’t met many people who don’t love crab cakes, unless they are allergic to seafood. Here on the East Coast they are famous because of the Maryland blue crab. When my Aunt and Uncle were visiting from Arizona last May they did a lot of sightseeing, and my Aunt tried a lot of crab cakes at various restaurants. 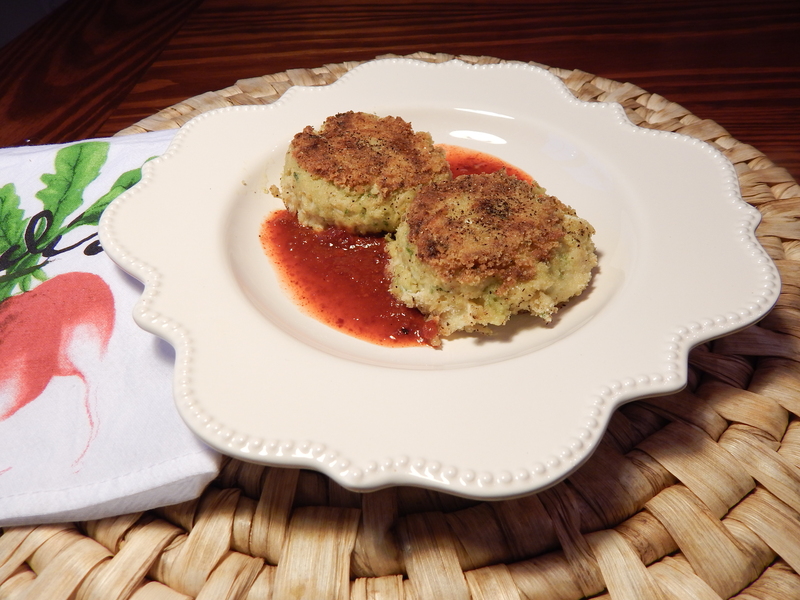 This is a favorite family recipe for crab cakes that I have reinvented to be grain free and low fodmap. They have completely delicious, wholesome ingredients. I serve them with sriracha sauce. They are exquisite without any sauce also! The sauce pictured in the photo is PaleoChef Sriracha Sauce I picked up at Whole Foods. My all time favorite homemade mayonnaise recipe is from the cookbook The Paleo Kitchen by Juli Bauer and George Bryant. It is 30-second mayonnaise and it is literally No Fail! You can find the recipe here. I had tried many homemade mayonnaise recipes before, and sometimes they worked and sometimes they failed. Plus, I just don’t have the patience to sit and drizzle! Sorry Julie Child. I still love you! This recipe uses an immersion blender, and is so fast! There is an SCD legal mayonnaise that is sweetened with honey that you can purchase as well if you don’t want to make your own, here. So let’s make some Chesapeake Crab Cakes! Preheat your oven 300º degrees. In a large frying pan, heat the garlic olive oil over medium heat, add the fennel and saute’ for 3 minutes, then stir in the green onion and continue to cook two more minutes, stirring frequently. Remove from heat and set aside. In a large bowl combine the mayonnaise with the spices, salt and pepper. Add the crab stirring lightly then the 1 1/3 cup of almond flour and fennel scallion mixture, again stirring just until combined. In a shallow dish place the remaining 1/3 cup of almond flour for dredging. 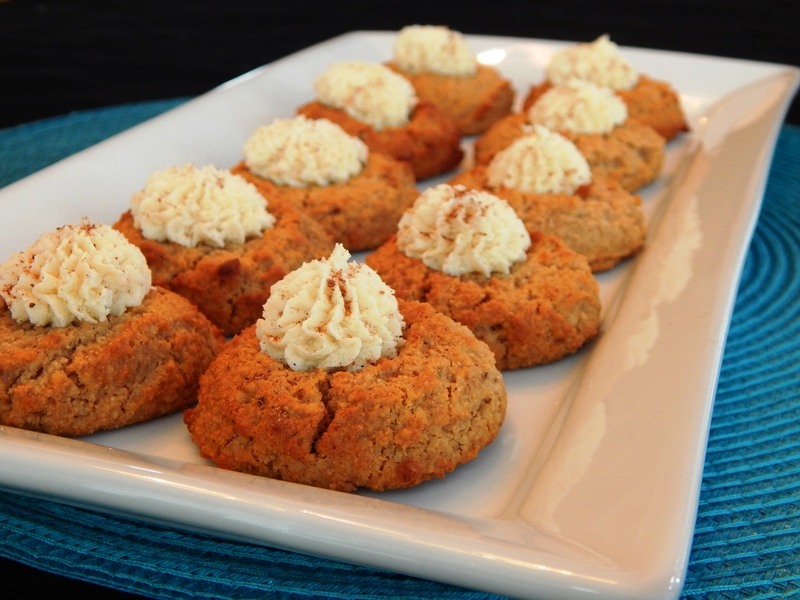 With a half cup scoop, scoop the crab cake mixture into the palm of your hand, and form into crab cakes. 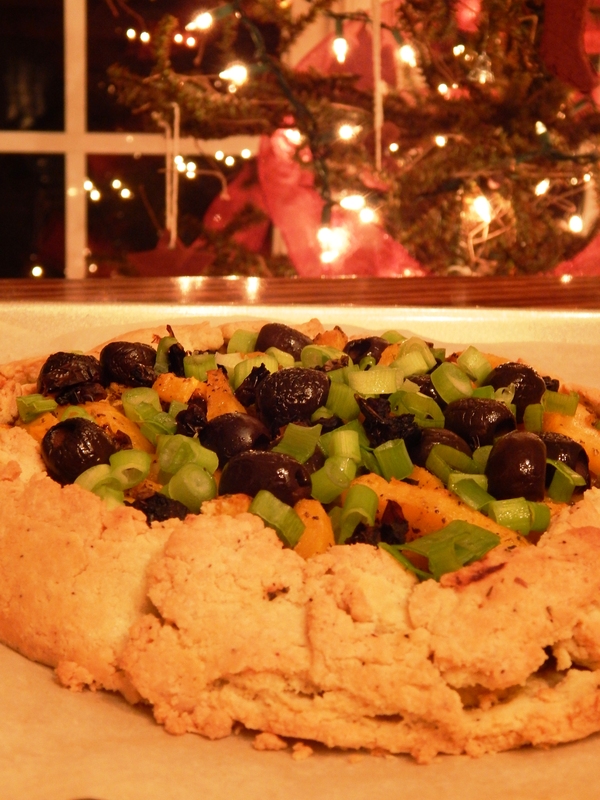 Dredge lightly in the almond flour and set aside on a parchment lined baking sheet. Use more almond flour for dredging if needed. In a non-stick frying pan, heat 1 1/2 Tablespoons of olive oil over medium heat until ready to sizzle when cakes are added. Add half of the crab cakes to the pan and fry about four minutes per side until golden brown. Remove them from the pan, and place on the cookie sheet and pop them in the oven to stay warm. Repeat with the second half of the crab cakes. They are ready! Confession! I love to eat eggnog anything during the holidays. Me and Eggnog Toasted Almond Ice Cream had an appointment yesterday with one of my favorite seasonal movies, The Holiday, with Cameron Diaz, Kate Winslet, Jack Black, and the very hot and English Jude Law. I love that movie! The English Cottage, Rosehill Cottage in England, is the home of Iris in the movie. It is ultra charming and such a contrast to the swanky Los Angles home of Amanda (Diaz). I love the thought of home exchange to travel, and am considering trying it myself. I can watch this movie every year during the holidays! 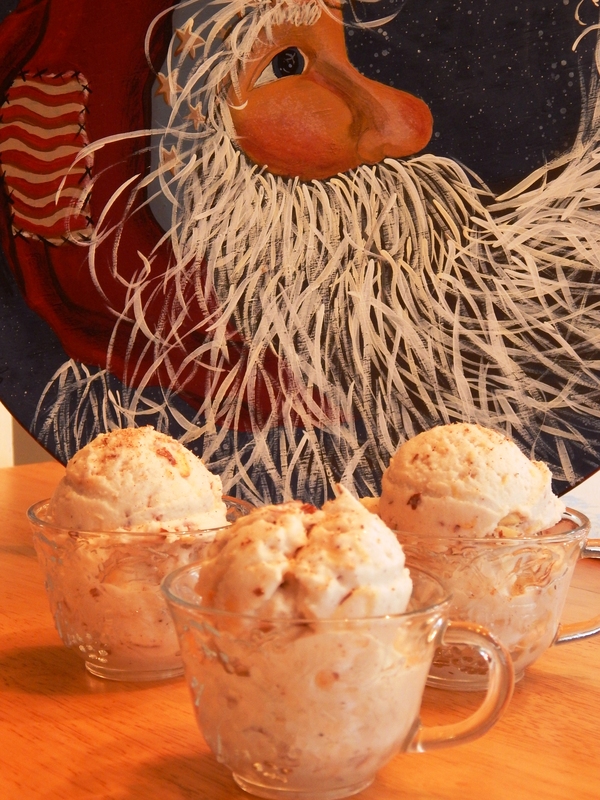 It is a feel good movie, and the Eggnog Toasted Almond Ice Cream is perfect with a favorite holiday movie. Hmmmmm, might have to have some while I watch Prancer! 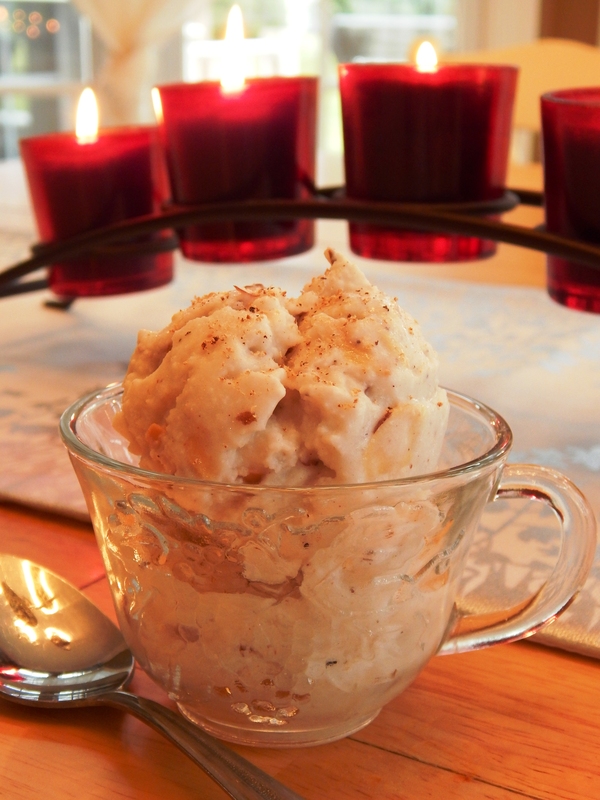 It is a great way to unwind with a healthier version of ice cream, during this sometimes stressful time of year, a movie and a seasonal favorite flavor! This recipe is a very authentic eggless eggnog recipe. So, if you are sensitive to eggs, or are looking for a dairy free, egg free recipe, this one is a keeper! Preheat your Oven 350º degrees. Lay the almonds on a cookie sheet in a single layer and toast in the oven for 5-7 minutes until just golden brown. Set aside for when you churn the ice cream. Mix together the remaining ingredients in a large bowl with a whisk. Refrigerate the ice cream base for 2 to 4 hours until very chilled. You can make it a day ahead too. Churn in your ice cream maker. It takes about 30 minutes. Add the toasted almonds the last five minutes of churning. Sprinkle servings with additional freshly grated nutmeg if desired. Now for a movie and ice cream to get those feel good endorphins maximized! 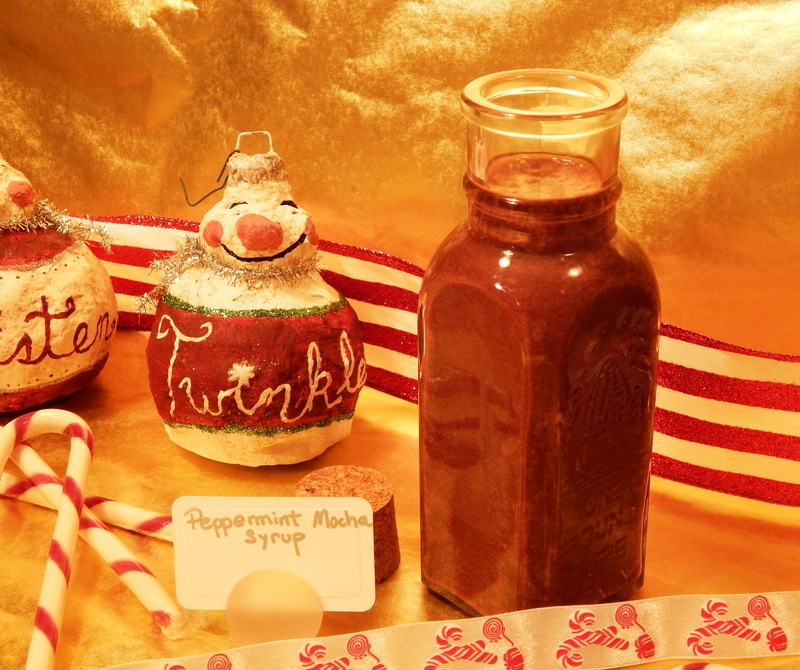 This recipe is for the Peppermint Mocha lovers in my life! My husband, Doug, uses it in his coffee, and my daughters like to add some to steamed almond milk for a Peppermint Hot Cocoa. They also put it on top of coconut milk ice cream! I put it out after a birthday dinner I had recently for my sister-in-law when I served the coffee, and it created a buzz! I sent a jar home with Jenni tied with red and white ribbon. 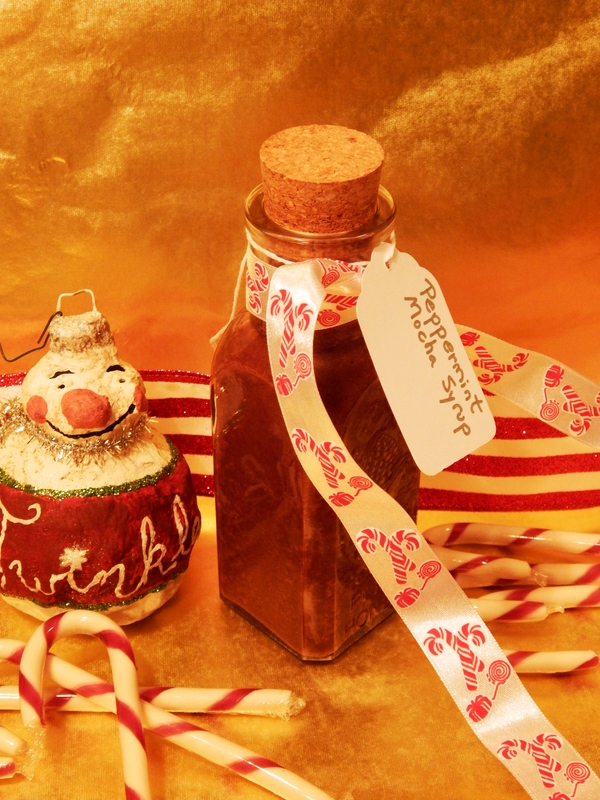 It makes a very nice homemade gift or a hostess gift! It is so delicious! It is sweetened with honey, and I use raw cocoa powder and gelatin in the recipe for body and added nutritional benefits. So, if you are going to have a treat, no need to feel guilty. For my SCD friends, the cocoa powder is not allowed on the SCD Diet. 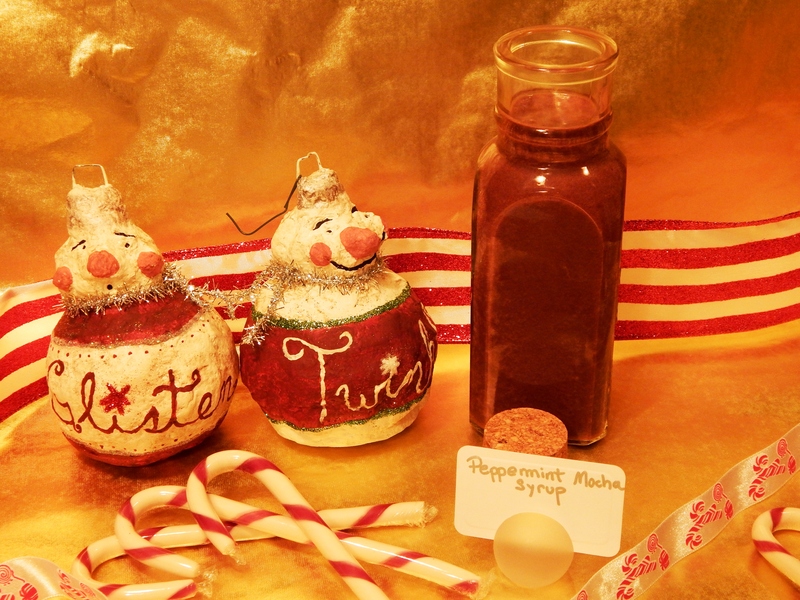 It is good also if the cocoa powder is omitted if you are a peppermint lover and would like a Peppermint Syrup. There are health benefits to raw cocoa such as flavonoid antioxidants. You can read more about the benefits of raw cocoa from ChocChick here. This is super easy to make! Blend all the ingredients in a blender. Store in a pretty glass container. That’s it! Super easy and delicious! This is a hearty meatball, and a delicious way to get in your greens! The meatballs are baked on top of the swiss chard (1 cup has 18 milligrams of calcium). Fats help with the digestion and absorption of vitamins and minerals in greens, plus it makes them taste so good! 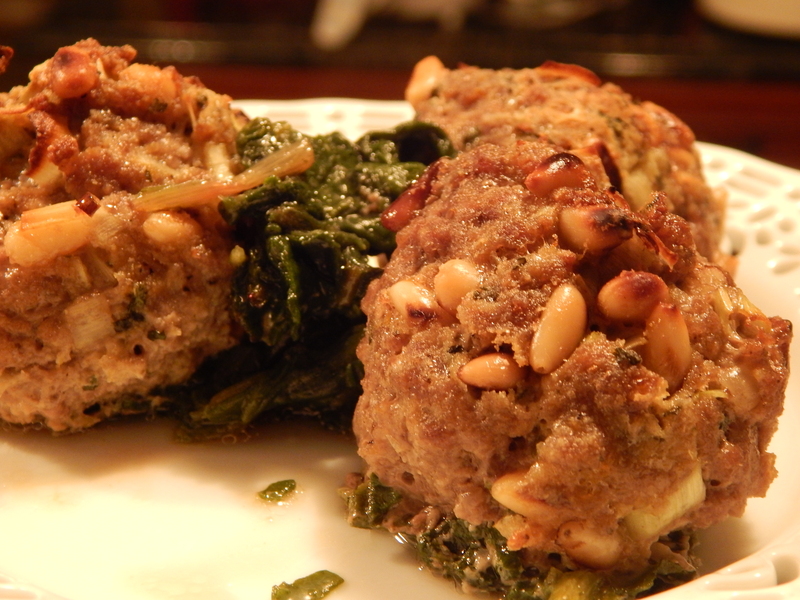 The pine nuts give the meatballs texture and personality. The mint, fennel, leeks and orange zest pair very well together with the lamb. This meatball recipe is an easy, one dish, main dish. Grass fed lamb is a good source of zinc, vitamin B12 and selenium. I also served this dish with roasted carrots, beets and a side salad. You can add any vegetables you like to your meal. Meatballs are so versatile! It is one of the things I love about them! Plus, since I have been really busy with my health coaching classes, this dish gets me out of the kitchen fast! I am sure many of you busy people out there will appreciate this easy, delicious recipe as much as I do! 1 Bunch of Swiss Chard, stems removed and coarsely chopped. Toast the pine nuts in a pan over medium high heat on the stove top for five minutes or until golden brown. 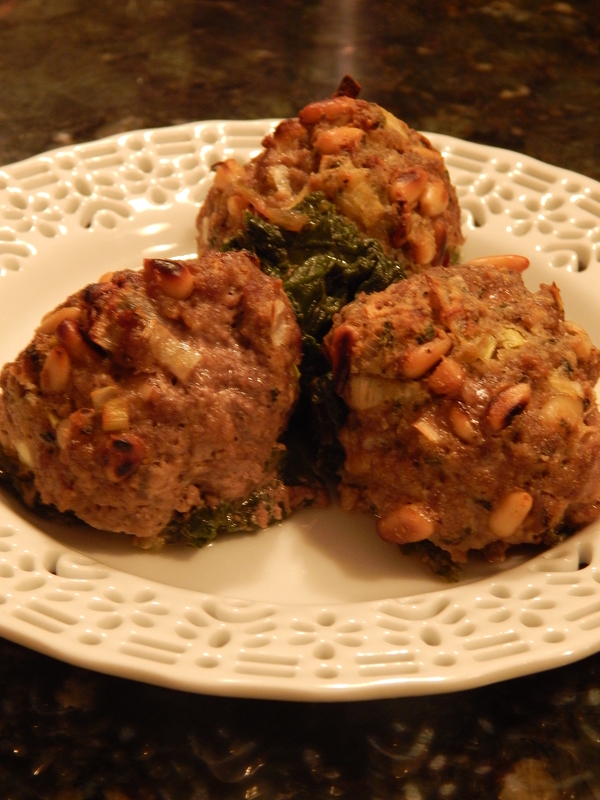 Mix together the ground lamb, pine nuts, and remaining ingredients except the chopped swiss chard. Form into golf ball sized meatballs. Place the chopped swiss chard in a large non-stick, oven-proof pan or large dutch oven. Toss with 2 teaspoons of olive oil and sprinkle lightly with additional salt and pepper to taste. Place the meatballs on top of the swiss chard, leaving space between the meatballs for even cooking. Place meatballs and swiss chard under the broiler, and broil for five minutes. Turn oven to bake at 375º degrees, and bake an additional ten minutes until the internal temperature of the meatballs reaches 165º degrees. At this point your chard will be nicely cooked, with the lamb juices incorporated into them, and the meatballs soft and tender. In a pinch, you can also use frozen chard with great results! Approximately 18 Meatballs. 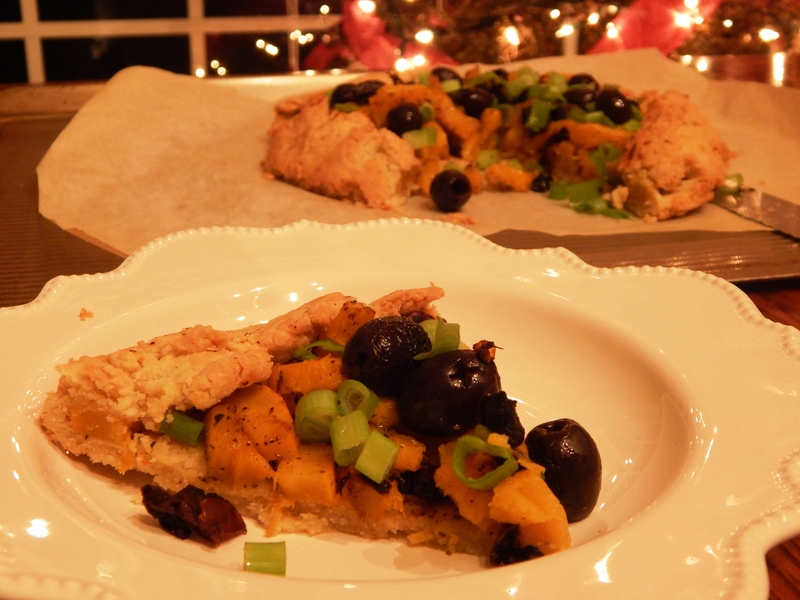 This rustic Galette is sure to please! It is a meatless main course, and is nice paired with a salad on the side. Delicata Squash are smaller than other winter squash and are tender with orange flesh. Four ounces of Delicata Squash has 3 grams of fiber and 2 grams of protein, in addition to vitamins A and C. I used two medium Delicata in the Galette. You can also substitute butternut squash for the Delicata if you can’t find it. I love the ease of making the rustic crust (no perfectionism here!) and it is fun to hear the oooo’s and aaaaa’s when you pull it from the oven! The sun dried tomatoes add delicious concentrated flavor, and the scallions and black olives add a finishing gourmet touch! Directions: Preheat your oven 375º degrees. Mix the crust ingredients in a large bowl until it holds together. Place the crust ball onto a parchment lined baking sheet and pat out with your fingers into approximately a twelve inch round, like you would a pizza dough. For the filling, place your peeled and cubed squash onto a parchment lined, rimmed baking pan and toss with 1 Tablespoon of Olive Oil, the Italian Seasoning, Salt and Pepper. Roast in the oven in a single layer for 20 minutes, stirring once. Remove from the oven and cool slightly. Drain the soaking water off your sun dried tomatoes and finely chop. Mound your squash into the center of the patted out galette crust and spread to within an inch and a half of the edges of the crust. Sprinkle with the sun dried tomatoes and olives. Gently fold the crust edges up and around the filling pressing a bit to keep it in place, a spatula can help here. Drizzle the filling with two teaspoons of olive oil. Bake for 20 – 25 minutes in the oven. Remove and sprinkle with green scallions. Serve and enjoy! Instead of visions of sugarplums dancing through my head, I have rum prints on my mind. What in the world is a rumprint? I found a recipe quite a few years ago in a holiday magazine. The cookies were very unique and memorable. I have never found another quite like them. Unfortunately, I lost the magazine at some point in a move I made. 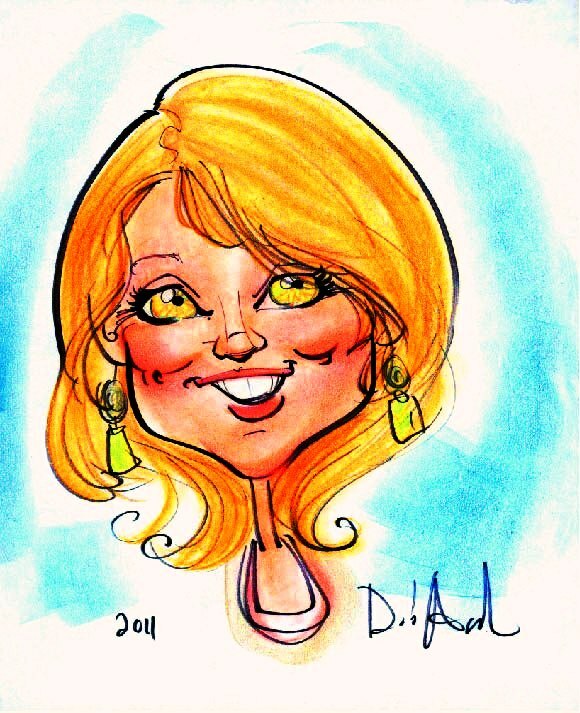 So, here is a replication from my memory of what they were like. These have been Paleo-ized, and I have to say, they are as good as I remember. 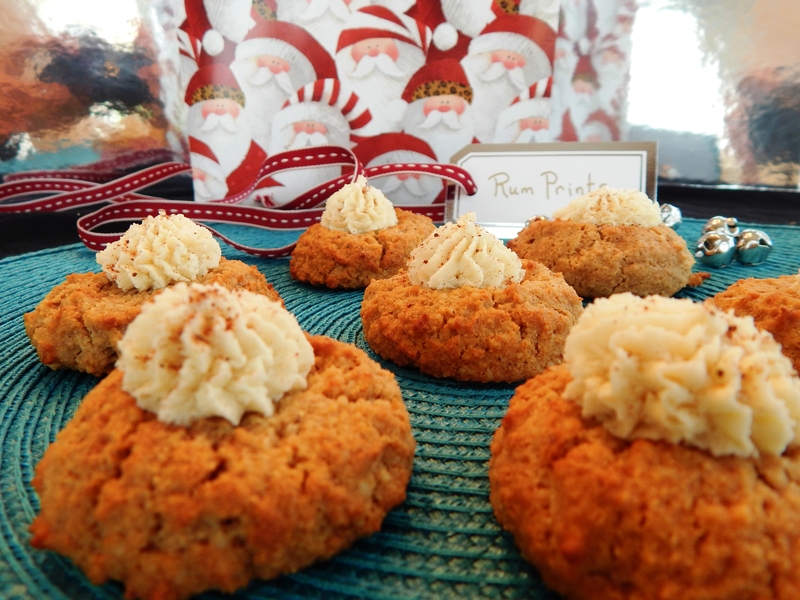 The cookie base uses finely ground walnuts, and the frosting uses cocoa butter for creaminess and stability. Directions: Preheat oven 350º degrees. With an electric hand held mixer, cream together the shortening and honey. Add the egg and continue to beat for one minute. Add the vanilla extract and incorporate. In a small bowl whisk together the finely ground walnuts, coconut flour, salt, nutmeg and baking soda. Add to the wet ingredients and mix on medium speed until blended. With a tablespoon cookie scoop, scoop the dough onto a parchment lined cookie sheet. Bake 11 minutes. When the cookies come out of the oven, using your thumb, make an indentation in the top of each cookie for the thumprint. Cool completely. Directions: In a double broiler, melt the cocoa butter. Remove from heat and add into a bowl. With an electric hand held mixer, beat the honey, salt and shortening into the cocoa butter. Add the rum and continue beating until the frosting is solidifying. The cocoa butter will start out clear when hot and become a white consistency as it cools. When it is a good texture for piping, place the frosting in a piping bag with a large star tip and pipe into the center of the cooled cookies. It sets up quickly, so pipe right away. Alternatively, you can scoop the frosting into the middle of the cookies by hand if you don’t feel like piping. Sprinkle each cookie with a dash of nutmeg.